Once thought not to be a risk factor for the development of vein disease unless it was extreme, being overweight has now clearly been shown to be associated with venous problems. In fact, studies now show that the more a person is overweight, the more likely it is that this person will develop vein disease and have an increasing severity of their vein disease when compared with normal weight individuals. Some studies from 2001 indicated that obesity was not benign. However, an excellent paper from the Journal of Vascular Surgery from last year clearly shows the relationship between weight and the severity of venous disease: the more a patient is overweight, the more severe the vein disease. Why should this be so? The first thing to consider is the nature of obesity. One needs to remember that fat accumulation occurs not only on the outside of the body where we can see it, but also on the inside—within the abdomen. This enlarged accumulation of fatty tissue within the abdomen increases the pressure on all structures within. That includes the large deep system veins that are on their way to conveying the venous blood back to the heart. Vein walls are thin and pliable. The increased pressure tends to compress them. This leads to a resistance to venous flow. This back pressure in the system increases the pressure in the lower extremity veins, partially blocking the flow of blood back to the heart, and increases the tendency to collect fluid in the legs. Another anatomic area where the excess fat can cause increased pressure is the area directly behind the knee. This area is naturally tight. There are a lot of important structures coursing through this space, which is bounded by bones and muscles on three sides. When excess fat collects here, the pressure in this space increases, much like it does in the abdomen. The structure most susceptible to this pressure is the deep system vein with its thin walls. The compression of the vein in this area is known as Popliteal Vein Compression and is a factor to consider in someone with obesity and symptoms and signs of chronic venous disease. The above 2 conditions have been studied in regards to the flow of blood in the venous system. Abnormal lower extremity venous blood flow patterns have been documented. 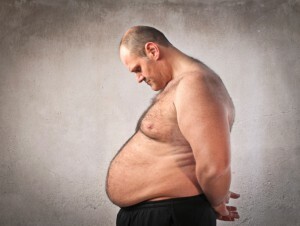 As a general rule, obesity is usually associated with a decrease in physical activity. This more sedentary life style results in much less activation of the lower extremity muscle pumps which help return blood to the heart. Obesity is also correlated with heart disease- ASCAD or arteriosclerotic coronary artery disease. People with this problem have a host of factors that come into play, resulting in decreased blood flow back to the heart, increased pressure in the lower extremity veins, and increased incidence and severity of chronic venous insufficiency [CVI]. The good news—this is a risk factor that is treatable and can, for most be eliminated. The reduction of sugar and carbohydrates in the diet is the key. Ingestion of protein and fat is encouraged. Since cholesterol is 40% of our brain mass and is present in every cell wall in our body, people need to realize that cholesterol, protein, and fat are not the enemies—it is sugar and carbohydrates. Below, I’ve included a YouTube video by Dr. Robert Lustig, a pediatric endocrinologist from the University of California, Berkeley. The video of his 2009 lecture, Sugar-The Bitter Truth, has more than 5 million view and offers an insightful view into his thoughts on sugar being the direct cause of obesity. If you are carrying around extra weight, take the steps necessary to get rid of that excess fat in order to place less stress on your venous system and other parts of your body.